The linear programming duality is well understood and the reduced cost of a column is frequently used in various algorithms. On the other hand, for integer programs it is not clear how to define a dual function even though the subadditive dual theory was developed a long time ago. In this work we propose a family of computationally tractable subadditive dual functions for integer programs. We develop a solution methodology that computes an optimal primal solution and an optimal subadditive dual function. We report computational results for set partitioning instances. To the best of our knowledge these are the first computational experiments on computing the optimal subadditive dual function. Klabjan, D. (2001a). 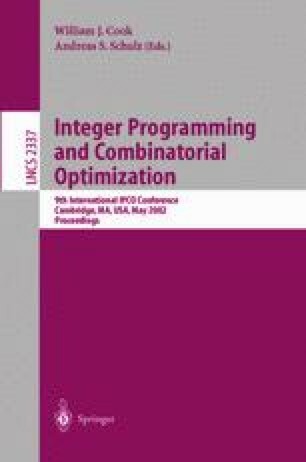 A new subadditive approach to integer programming: Implementation and computational results. Technical report, University of Illinois at Urbana-Champaign. Available from http://www.staff.uiuc.edu/~klabjan/professional.html. Klabjan, D. (2001b). A new subadditive approach to integer programming: Theory and algorithms. Technical report, University of Illinois at Urbana-Champaign. Available from http://www.staff.uiuc.edu/~klabjan/professional.html.